The United Nations humanitarian chief says the way civilians are being treated by the north in the Sudanese state of Southern Kordofan is “reprehensible” and called for unfettered access to the tens of thousands displaced by the recent fighting between northern and southern troops. 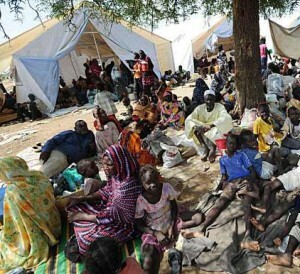 More than 70,000 people have been displaced due to the violence in Southern Kordofan amid intermittent fighting between the northern army known as the Sudanese Armed Forces (SAF) and the Sudan People’s Liberation Army (SPLA) of Southern Sudan. “The treatment of civilians in South Kordofan, including the reported human rights abuses and targeting of people along ethnic lines, is reprehensible,” Valerie Amos, the Under-Secretary-General for Humanitarian Affairs and Emergency Relief Coordinator, said in a statement issued on Tuesday. She also called for an end to insecurity and movement restrictions, which are continuing to limit the ability of humanitarian personnel to assess the situation, to provide people the aid they urgently need, and to re-supply stocks. “The threats to aid workers and peacekeepers need to stop immediately,” she added. Last week, the UN strongly condemned the detention and abuse by the SAF of four of its peacekeepers who were on patrol in Kadugli, the main town in Southern Kordofan, noting that the world body’s staff are critical to providing humanitarian aid to vulnerable populations. Ms. Amos also voiced concerned that the overall security situation in Sudan is deteriorating at an “alarming rate,” and that civilians are increasingly bearing the brunt of the volatile and uncertain political climate. The conflict has also prevented sowing at the beginning of the agricultural season which will cause food shortages, her statement noted. “We could be facing a worst case scenario, with millions of civilians in both North and South Sudan in need of protection and critical humanitarian assistance,” said Ms. Amos.